Lack of sleep is an epidemic that is actually killing us—research found connections to cancer, diabetes and heart disease that stem from a lack of quality rest. This is exacerbated by a culture that seems to prize lack of sleep. Treating irregular sleep like a boast has been recognized as a pervasive bad habit. Add the recent rise in wearable tech that allows us to track our sleep more effectively and all this has been (pardon the pun) a wake-up call. Now everyone is looking for more effective solutions to sleep deprivation. There are a number of good non-medicated ideas out there for sufferers of insomnia and general sleep loss including everything from keeping away from screens right before bed to drinking warm drinks but there are also ways to condition the place where you sleep that can help you have an improved and more restful sleep cycle that you may not have considered. A National Sleep Foundation study has shown that wearing socks improves sleep. This is likely because cold extremities hinder a good night’s sleep. Maintaining a dark room is excellent for sleep (and that means no night lights) as these can confuse the brain’s sleep center. And consider blocking out the digital readout from your alarm clock as this also has a deleterious effect on your sleep. Blackout curtains help, but getting a clock that doesn’t light up will be even more effective. An ideal temperature is around 65 degrees Fahrenheit (18 degrees Celsius). If your room is too warm or too cold it can inhibit sleep and while lots of blankets seem to do the trick in a cold room they can get overly hot during the night and you can shed them, leading to being too cold. This vicious and often unconscious cycle disrupts your natural sleep pattern. Obviously you want to get sheets, pillows and mattresses that are comfortable to you. Make sure to consider things like pleasing colors as well as desired softness. And hypo-allergenic materials are very important to anyone susceptible to allergic reactions. If possible, face your bed away from the windows so that the light is less likely to bother you. Soothing wall colors in pale shades might help you feel your environment prepares you for sleep. Organizing your bedroom so that it is clear of clutter will keep your mind off of the mess and onto deep sleep. Plants generally consume the carbon dioxide we breathe and replace it with oxygen, creating an atmosphere that automatically makes it easier to sleep. Having houseplants is generally good for the micro-environment in your home, but it’s useful to know that some plants are genetically predisposed to be more effective than others when it comes to their specific soporific traits. Some even have been proven to clear out toxins like formaldehyde. Dromma suggests 15 plants for your bedroom to assist in your sleep. You may consider yourself a brown thumb, but most of these are easy to cultivate and maintain. 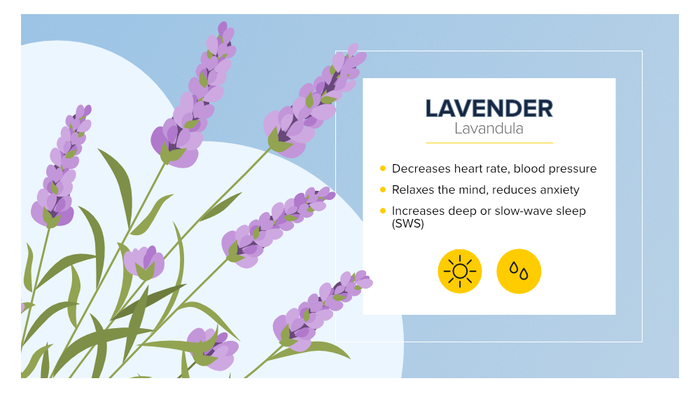 Well known as a sleep aid, the lavender scent has been proven to improve slow-wave sleep and there is anecdotal evidence that those who smelled lavender before bed woke up with more energy. The plant is easy to cultivate and just needs direct sunlight and relatively dry soil. If having the living plant is too complex for you, using a lavender oil scent will certainly do a similar trick (though it won’t make oxygen for you). Also known as mother-in-laws tongue, this plant has a special adaptation that makes it excellent for the bedroom. It transfers carbon dioxide into oxygen at night, rather than during the day. This means it does its work while you are sleeping. 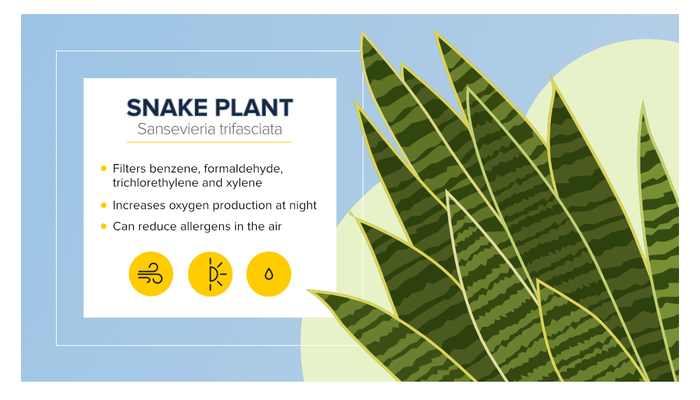 In addition, NASA scientists studied sansevieria trifasciata and found it to be very effective in removing toxins like benzene, formaldehyde, trichlorethylene and xylene from the air. That’s something that should make you sleep better at night. The snake plant is an ideal starter plant because it reacts well to any level of light and erratic watering. 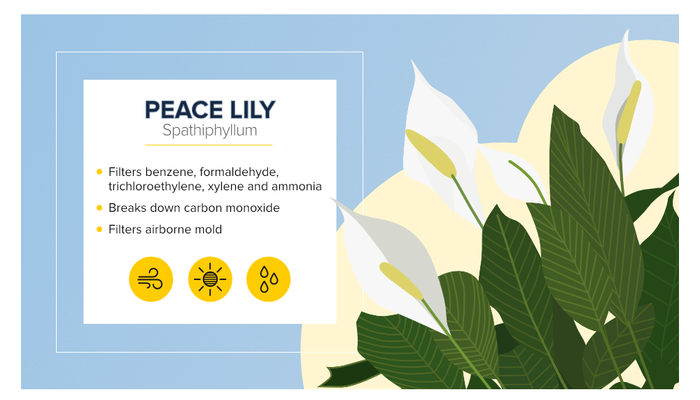 An attractive plant to introduce to the home, with deep green leaves and white flowers, the lily loves to consume toxins like benzene. Another aspect of the peace lily that helps with sleep is that it breaks down mold that can create restless nights for allergy sufferers. Another easy one to keep healthy, it doesn’t need much light and only needs water once a week or so. There are many ways to make sure that your sleep is as restful as possible, but it all starts with the arrangements in the room where you put yourself to bed. 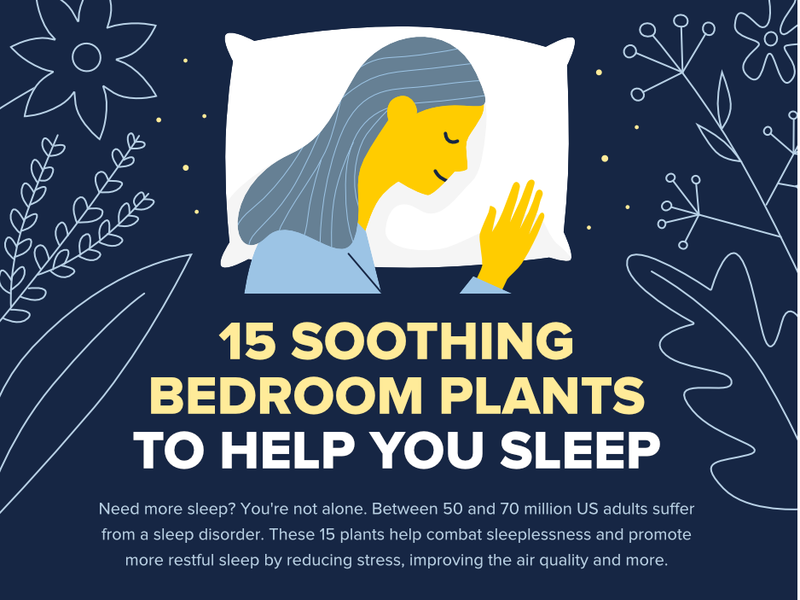 Learn more about plants for sleep problems here. This post was written by Taylor Jones, the director of digital marketing at Soft-Tex International. Taylor is passionate about helping people get the best night’s sleep possible. He earned an MBA from Queens University of Charlotte after attending the University of South Carolina Honors College for undergrad.